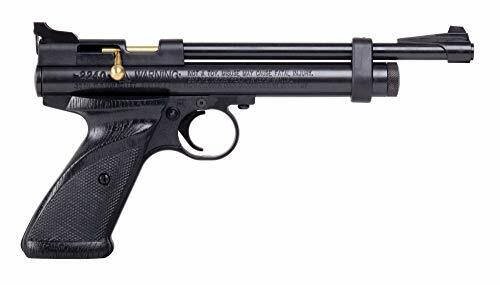 An affordable unit with a .22 caliber, the Crosman Bolt Action CO2-Powered Pistol is as inexpensive, as it is bold-looking. In this comprehensive Crosman Bolt Action CO2-Powered Pistol review, we’ll highlight why this is the most amazing firearm you will ever hold in your hand. This truly encompasses the excellence of Crosman firearms available on the market. Considered a building base for those who love to transform and improve their pistols, this gun can shoot up to speeds as high as 460 FPS (feet per second). Even though it does not have the liberty to cause considerable damage from a long range, this pistol could certainly make a hole through a rodent at close range. This is a very customizable air pistol. When you purchase this gun, you’re essentially acquiring a functional base upon which to construct your own custom firearm to your liking. For best performance, the accessories with which you customize your gun should be from the same brand, but different parts from different Crosman models are compatible. Ideally, this basic hand-piece is great for race-gun shooters who need to get in more practice than they otherwise would with their professional race-gun. A number of users proposed the idea of using a silencer on this gun, as it manages to give off a loud sound when shot. 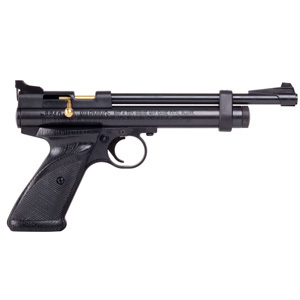 The Crosman Bolt Action Pistol makes use of cartridges that hold 12 grams of CO2. Furthermore, it is your go-to unit if you wish to practice plinking. Completely made up of metal, this gun is durable, lasting for a long period of time, given that it is looked after well. The rear sight of this gun is open, enabling the owner to adjust it as required. When paired with different add-ons, this unit is tough, striking and allows beautiful, fluid shots. The gun is powerful, causing substantial damage. This makes the gun fit for both target shooting and pest control too. Add-ons could be made use of, to upgrade this gun without any hassles. The gun is ambidextrous, allowing both left-handed and right-handed people to make use of it with considerable comfort. Loading this gun is quick and simple, thanks to the large loading trough. The thumb rest is a little higher than usual, making it tough for a few people to operate this unit. This unit’s rear sight is made up of plastic, which could prove to be quite flimsy. It could be knocked out, even with the smallest push or bump. As per the comments made by customers, this gun requires several upgrades to make it perfect for clean and accurate shots. Needless to say, this means spending more expenses. This CO2-using pistol definitely garners mixed reviews from many users, despite being powerful and inexpensive. This is a gun produced by a company of countless notable pistols, but our particular Crosman Bolt Action CO2-Powered Pistol review leads us to the conclusion that this gun is just right for you if you plan on upgrading it with the best aftermarket parts that could be found and bought from the marketplace. However, this is only possible if the owner has no trouble with spending lots of cash. Gun control equals three shots in the same hole.